Hi everyone, I'm new here. Luckily I have just learned U2 are playing in my place , Argentina, in October . I'm in the clouds!!! I need advice for the ones who have already been in TJT concert. tomorrow is the pre-sales and I want to have the best seat possible (forget about how much, I've already sold my kidney!! JOKE!!!!!) Any piece of advice, please?????? Thanks!!!! In December last year I was very lucky to purchase two tickets for the show in Berlin tomorrow. In mid August I had an emergency surgery. Currently I am at rehabilitation and not allowed to be there... Can hardly believe it... 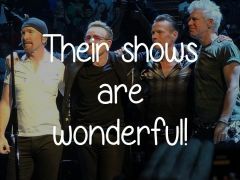 So, to all the lucky ones who will visit the shows in Berlin: Have fun and enjoyable nights with the band! Estou amando acompanhar os shows, todas as música são maravilhosas!